I love this new fashion trend – when luxury brands serve as cultural resource rather than just consumption good and feed creativity and inspire new products that are much closer to popular culture than originals – especially price-wise. So far my favourite product of that kind was Thursday Friday canvas bags with Chanel and Balenciaga bag prints (read more about it here), but now I found two new contenders – this post is about my first find. This is Brian Lichtenberg’s creation – Homies print, inspired by Hermes logo. What a great way of taking this classy brand and bringing it down to the urban level. Trucks and homies are definitely closer to most people’s everyday lives than horses, carriages and gentleman! J’adore! Plus you have a choice between cotton T-shirt (£65) and cotton sweatshirt (£100) – both available at BrownsFashion.com. But if you want to get your hands on one, hurry – Tees are selling out fast! Excitement in the air! For 24 hours only (until noon on Monday) ASOS is having a special Tick, Tock, Shop event with 60% off cult denim and T-shirt brands. And the one brand I am most excited about – the one I just had to share with all of you – is celebrity favourite Wildfox. Established in Los Angeles in 2007 the brand creates vintage-looking pieces inspired by fun, love and friendship – the values close to heart to two childhood friends that are behind the brand’s designs. The success was almost instant: laid back California fell in love with comfy fits and tongue-in-cheek slogans and thanks to celebrity following (it is actually hard to think of any young and hip American celebrity who has not been seen wearing their pieces) that love spread world-wide. Take a look at my favourite pieces currently on sale and then go to ASOS.com for full range. But hurry up, the stock won’t last long! I have to admit my favourite item of clothing is cotton T-shirt: whether it is cropped, with cut off sleeves, racer back, plain colour, printed, has statement writing etc (Let’s just say my definition of T-shirt is not narrow and also includes vests, cropped styles and so on). And I get excited whenever I see some realy cool additions to my collection that I can simply put on in the morning with my favourite jeans and sunnies and feel like a million bucks (that’s one of the reasons I am looking to one day move to LA, weather here in London hardly ever allows me to indulge in one-layer-of-clothing ensemble). And I just have to share my finds with you – all these cool and highly affordable T-shirt are from Republic.com. So if you are in need to stock up on every day essentials, I am sure you would find a few others to add to your basket. We all want an easy going outfit for the weekend and there is nothing better than spicing up your comfiest look with a statement tee! I am always on a look out for new ones and my collection is huge! And currently I can’t take my eyes off United Couture – a community of artists that only joined together this year to create a fun brand that is inspired by retro Studio 54 and LA sun. I absolutely love the statements – words to live by indeed! Shame in UK we can only get a limited range of what would be your favourite casual top. 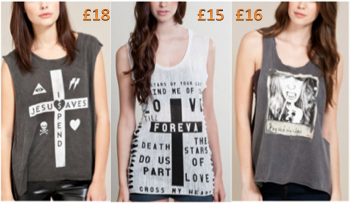 Go to http://www.spoiledbrat.com to get a 25% discount on all items above (it means only £33.74 each). Happy Weekend! You are currently browsing entries tagged with t-shirt at MY FASHION WISH LIST.